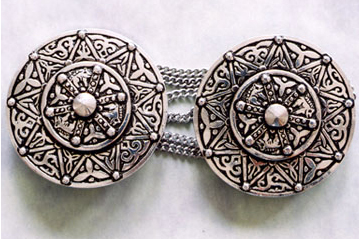 These medallions have two sewing stations each and are approximately 45mm across. 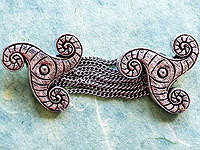 The triskelion design is an adaptation of a motif common among Celtic cultures from the neolithic period to our own time. It is a truly timeless design that will complement either an elegant dress cloak or a rugged, all weather, all-day cloak. 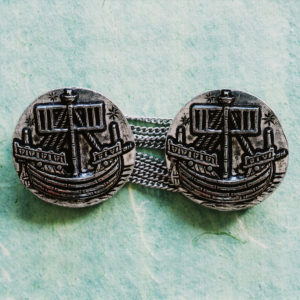 This fully functional set of cloak clasps are suitable for a medium-heavy weight cloak. 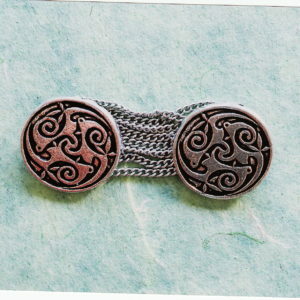 If you are interested in a more enclosed trikelion pattern we suggest the Crescent Trinity Pattern cloak clasp set.